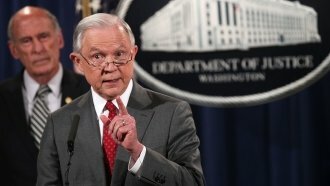 The Justice Department said Wednesday morning it was stepping up efforts to criminalize sanctuary cities. After the Trump administration touted a crackdown on so-called "sanctuary cities" Wednesday, several Democratic mayors fired back, saying they wouldn't meet with the president at the White House. Mayors from all over the country were set to talk to President Donald Trump about infrastructure. They're already in D.C. for their annual winter conference of mayors. But the Justice Department said Wednesday morning it was stepping up efforts to criminalize sanctuary cities, and plans for a meeting at the White House ... changed. "I can't ever recall a situation where someone who professes to want to work with other people punches them in the face first and says, 'Now I'd like to talk to you,'" New Orleans Mayor Mitch Landrieu said Wednesday. New York City Mayor Bill de Blasio tweeted that he wouldn't attend the meeting either.